When you want to lose weight, jogging is one of the more efficient ways to go about it. Jogging burns calories quickly and builds muscle which, over time, will also contribute to your calorie burn. The amount of jogging you will need to do to lose weight is determined by your body size, lifestyle, diet, and individual metabolic factors. In order to lose one pound, you will need to burn 3500 calories more than you eat. The number of calories you burn while jogging depends on how much you weigh; the more you weigh, the more you will burn. A 155-pound person burns 596 calories in an hour of jogging at five miles an hour, while a 185-pound person burns 710 calories. If you are running on a treadmill, you can figure out how many calories you burn by inputting your age and weight. If you run outside, use an online calculator like the one at CaloriesPerHour.com. In order to maintain a steady weight loss that you can keep off, it is crucial to set an exercise schedule that works with your professional and social life. If you weigh 155 pounds, you need to jog for an hour at five miles an hour, six days a week to lose a pound a week. By leaving one day for rest and recovery, you can help your muscles rebuild, which will make your next workout stronger. If you are not at a level of fitness where you can jog for five miles at a time, you can work up to it gradually to avoid injuries. 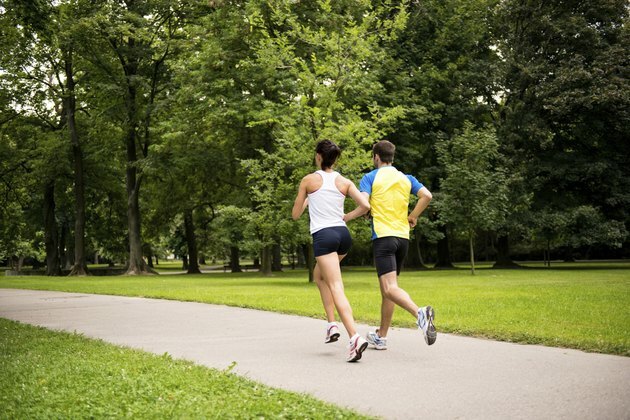 To burn calories while you are building up to long periods of jogging, use intervals. Add intense, short bursts of faster speed and/or incline burns calories faster than working out at a steady pace. Because short intervals boost your heart rate, the overall intensity will be higher -- and so will the total calorie burn. For new joggers, it can be difficult to lose weight only through working out. To get the most out of your exercise, combine it with healthy diet changes. Eat whole, healthy foods to give you energy for working out, and remember to refuel after a run. Create a calorie deficit by cutting out indulgences, but don't eat less than 1,500 calories; as eating less can compromise your metabolism, making it more difficult to lose weight.